Year 1700 (MDCC) was an exceptional common year starting on Friday (link will display the full calendar) of the Gregorian calendar, but a leap year starting on Monday  of the Julian calendar. The Gregorian calendar was 10-day faster until February 28 [O.S. February 18, 1700] 1700, but 11-day faster since March 1 [O.S. February 19, 1700] 1700, than the Julian calendar. Jan. 26: Cascadia Earthquake / tsunami. Russia accepts the Julian calendar. Germany and Denmark-Norway adopt the Gregorian calendar, including the convention that New Year's Day is January 1. 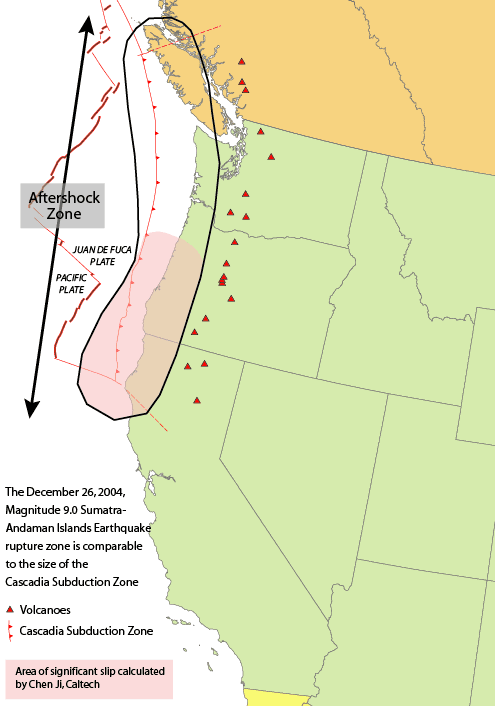 January 26 - The Cascadia Earthquake, one of the largest earthquakes on record, ruptures the Cascadia subduction zone offshore from Vancouver Island to northern California, creating a tsunami logged in Japan and oral traditions of the American First Nations. March 11 [O.S. February 29] 1700 (Swedish calendar March 1) - The Swedish calendar is adopted. 1700 of this calendar is a common year starting on Monday. April - Fire destroys many buildings in Gondar, the capital of Ethiopia, including two in the palace complex. May 5 - Within a few days of John Dryden's death (1 May O.S. ), his last written work ("The Secular Masque") is performed as part of Vanbrugh's version of The Pilgrim. May - In Rhode Island (American colony), Walter Clarke, former governor 1679-1686, becomes governor again for 14 more years. November 20: Battle of Narva. November 20 - Great Northern War: Battle of Narva - King Charles XII of Sweden defeats the army of Czar Peter the Great at Narva. November 23 - Pope Clement XI succeeds Pope Innocent XII as the 243rd pope. December 28 - Laurence Hyde is appointed Lord Lieutenant of Ireland. Vietnamese gains control of the entire Indochina peninsula. The Great Northern War begins with Russia, Denmark and Saxony/Poland making a coordinated attack on Sweden (to 1721). Control of Spain passes from the Habsburgs to the Bourbons. Mission San Xavier del Bac is founded in New Spain near Tucson, as a Spanish Roman Catholic mission. A fire destroys the larger part of Edinburgh, Scotland. ^ "Calendar in year 1700 (Russia)" (full Julian calendar), webpage: Julian-1700 (Russia used the Julian calendar until 1919). This page uses content from the English language Wikipedia. The original content was at 1700. The list of authors can be seen in the page history. As with this Familypedia wiki, the content of Wikipedia is available under the Creative Commons License. 82 people were married in 1700. There were 0 military battles in 1700.